The global solar market has yet to show signs of turnaround after going through the turbulent 2016. 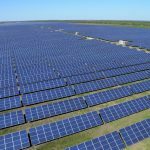 The latest Gold Member Solar Report by EnergyTrend, a division of TrendForce, forecasts that the global PV demand for 2017 will total just 73.9 gigawatts. 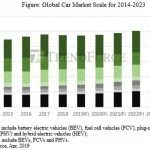 This year’s PV demand growth will be nearly flat for the first time after years of expansion. Also, the ranking of the top three regional solar markets will likely change this year, with India having the opportunity to displace Japan to become the world’s third largest. MRNE made an assessment on the impact of GST on the domestic solar market and estimated that some solar products can be subject to a rate as high as 20%. This in turn will drive up costs across the domestic PV supply chain and raise levelized cost of electricity for PV power generation by 13~15%. Tsai also stated that irrespective of the GST rate, an installation rush is expected to take place in India during the first quarter before April, when the nation-wide sales tax is officially implemented. This wave of urgency to install PV systems will be the main demand driver for the country’s solar market for the first quarter. 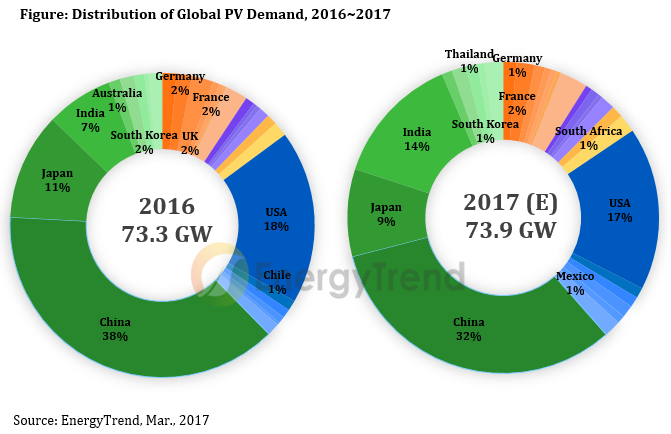 EnergyTrend expects that India will add at least 10 gigawatts to its domestic PV installations in 2017, allowing the country to overtake Japan and become the third largest solar market in the world.